One of the hottest 360-degree cameras right now is Samsung’s Gear 360. When Samsung began accepting preorders for it in Korea, they reportedly sold out within minutes. On eBay, it has been sold at up to $200 over its Korean MSRP. But one of the drawbacks of the Gear 360 is that it is compatible with only recent high-end Samsung Galaxy phones, namely the Samsung Galaxy S6, S6 edge, S6 edge+, Note5, S7, and S7edge. As with other 360-degree cameras, connecting to a smartphone allows the user not only to shoot remotely, but also control the exposure, and share photos and videos to social media. Not having a compatible smartphone is a serious disadvantage. Ordinarily, that would be a dealbreaker, but the Gear 360 has an ace up its sleeve: preliminary reports and samples seem to show that the Gear 360 has one of the best, if not the best, image quality for video among consumer 360 cameras as of the moment. Here are some sample videos. Suppose you wanted the Samsung Gear 360, but don’t have a compatible smartphone. What can you do with the Samsung Gear 360 without a smartphone? The Gear 360 has a power button, menu button, and shutter. Pressing the menu button cycles through several options, pressing the shutter works as entering the option, and pressing the power button cancels or goes back to the previous menu. The self-timer can be changed from 2, 5 or 10 seconds. This makes it somewhat possible to shoot from a distance. In the settings menu, you can also change the resolution and quality. What about sharing your photos? If your smartphone has a Micro SD card slot, you may be able to download photos that way. Once downloaded, there are several apps that you can use to view and share a 360-degree photo or video. Otherwise, you’ll have to download to your desktop. Please note that the included desktop software is Windows only. If you have a Mac, you may be able to edit the video in equirectangular format on iMovie or Final Cut. You just need to edit the metadata so that sites such as YouTube can recognize it as a 360-degree video. If you have a Mac, you can only download the video in raw form, which shows two circular fisheyes. The raw form cannot be processed using the Theta360 app. (Thanks to Paul Gailey for pointing this out!) UPDATE: The raw video can be stitched in Autopano Video. See here. Will Samsung add compatibility with other smartphones in the future? In my opinion, it seems doubtful. True, there are Samsung apps on the iOS App Store (such as the Samsung Camera Manager for controlling Samsung NX cameras). However, Samsung seems to be more closed when it comes to VR and 360. Specifically, they haven’t opened the Milk VR app to other Android phones, even though it is technically possible. 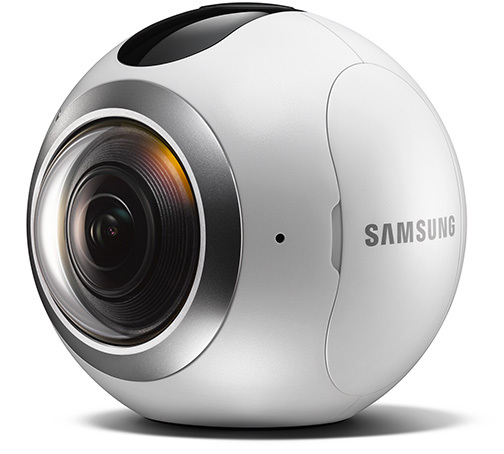 Meanwhile, is it possible to use the Samsung Gear 360 without a compatible Samsung smartphone? Yes, with several limitations. Hey, I’d like to know if I can change the rate on the time lapse feature without a smartphone. It may not seem like it, though. How do I do that? Somehow I can’t find the right information anywhere.